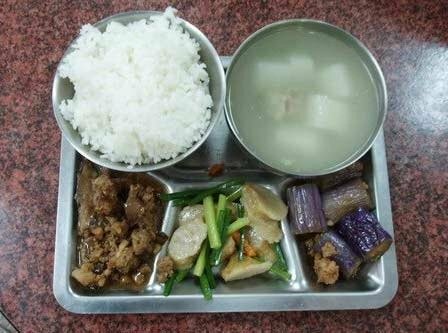 >> 15 School Lunches Around The World That Might Freak You Out! Would your kids eat goulash soup or mussels for lunch? What about seaweed? 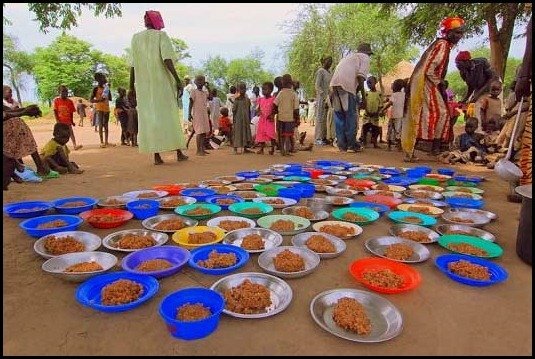 Depending on what country you are in, these are things regularly served to kids at school. 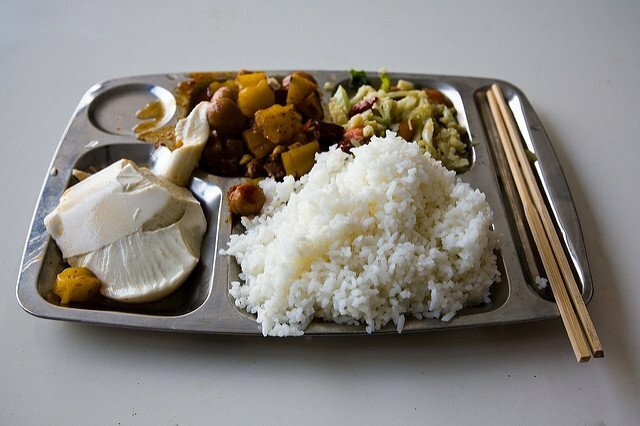 Here are actual photos of school meals from 15 countries around the world. You may be surprised. After living in the US and Canada as a child and seeing what my own children ate for lunch at school in California, I am all too aware of just how bad school lunches can be. A veritable revolving door of unhealthy fast-food, burritos, tacos, pizzas and enchiladas. Some schools even have onsite McDonald’s’ and taco bell: YUCK! But not all countries have such unsavoury institutionalized school lunches for school aged children. Take for instance what my daughter ate at her preschool while living in France. 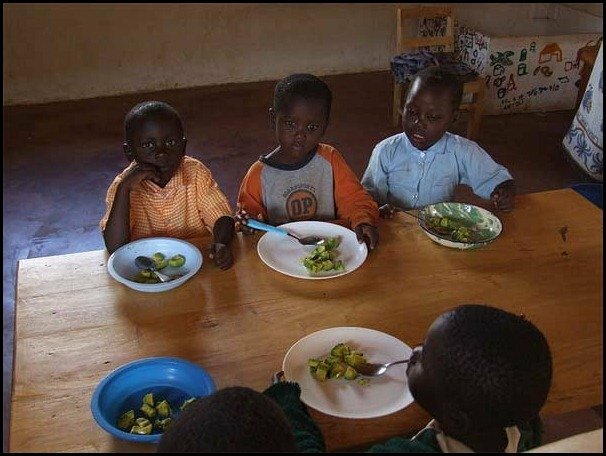 On the other end of the spectrum are school lunches in lesser developed countries like in Kenya where some kids only get a bowl of fresh avocados. 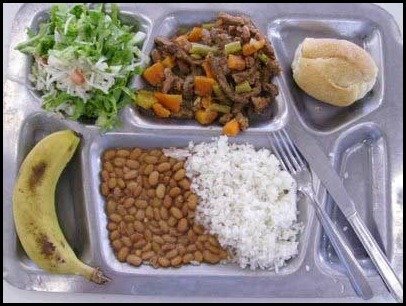 Below are photos of actual cafeteria lunches and descriptions of 15 school lunches from around the world. Menu: Enchiladas with beans, rice, fresh strawberries and milk. 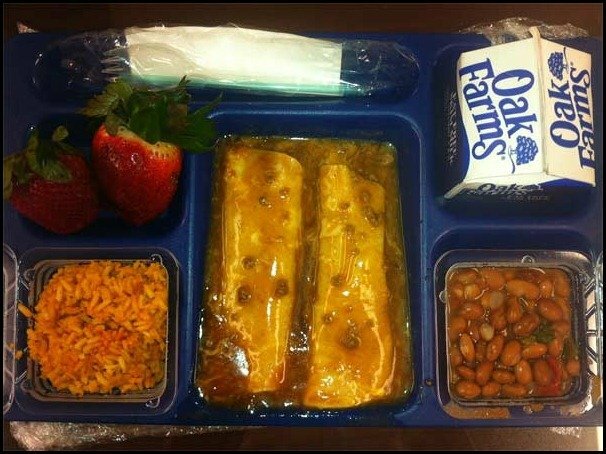 This American school meal actually does not look too bad. It’s pretty typical for schools to serve Mexican inspired dishes like this one. Milk is almost always served in U.S. schools. Unfortunately the variety served at the schools my children went to in the U.S. were usually a rotating menu of burgers, burrito, pizzas, tacos. They even served McDonald’s burgers at school. Pre-school Lunch: Rice w/konbu (a sweet seaweed), nikkujagga (beef with veggies), omelets, sausage, potato puff, and apple. 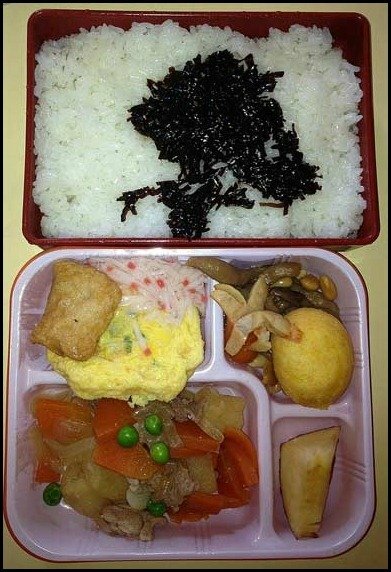 This is a school Lunch at a pre-school in Japan where the kids range in age from 1-6yrs old. 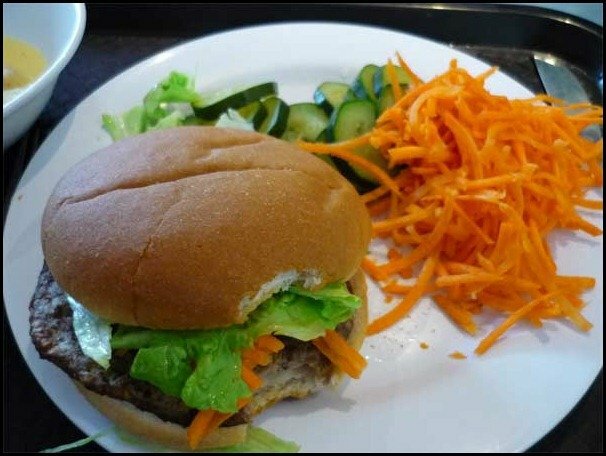 This pictures one of the “teachers” lunches which is exactly the same as the kids meals except with smaller portions. Menu: Tofu, rice and vegetables. Tofu would never be served in a school in the U.S. I grew up eating tofu and absolutely love it. This looks like it could be a home cooked meal to me. Pretty good. I wonder what kids from Brazil think of this. Menu: On the left: mushroom and minced pork, in the middle: Chinese chives stir fry with tempura, on the right: eggplant (probably stir fry), soup with radish and pork, and steamed white rice. 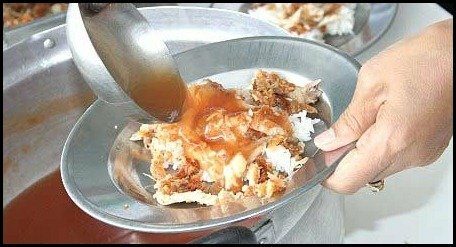 Menu: Looks like rice with some kind of sauce. Maybe protein? This doesn’t look like much compared to what eastern kids eat. Menu: Sautéed chicken over rice. I am sure whatever this is, it is probably pretty tasty. 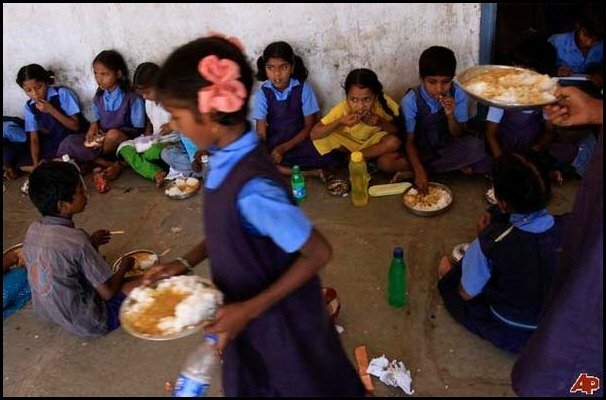 Most of the kids eat at school canteens (it’s convenient and cheaper for their parents). The lunch usually consists of a soup and a main course. Usually there is a salad or some sort of fruit along with something sweet for desert. There is always tea and water with sweet syrup on tap and cacao if sweet buns are for lunch. I’m not really sure what this is? Maybe it’s rice or corn paste? This photo kind of shocked me. This meal of avocados may look measly but it is very nutritious. The fats from the avocado are invaluable, especially in a country where malnutrition is so widespread. Menu: This is probably a rice and curry dish. It’s not uncommon for kids in India to eat on the ground outside. And yes, kids in India eat with their hands. 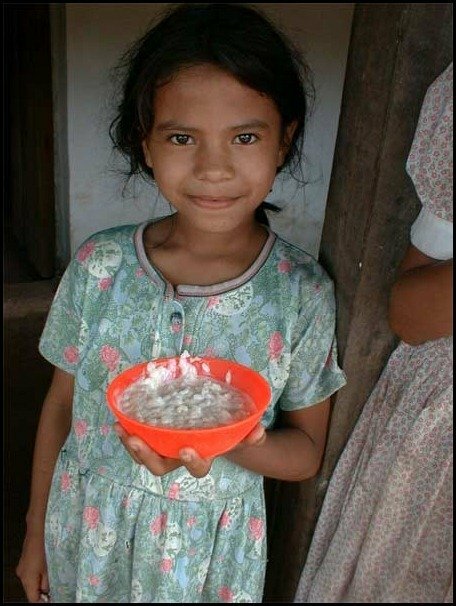 Menu: Arroz Con Leche (Rice with milk). You can eat it cold or hot and it is often seasoned with cinnamon and vanilla. 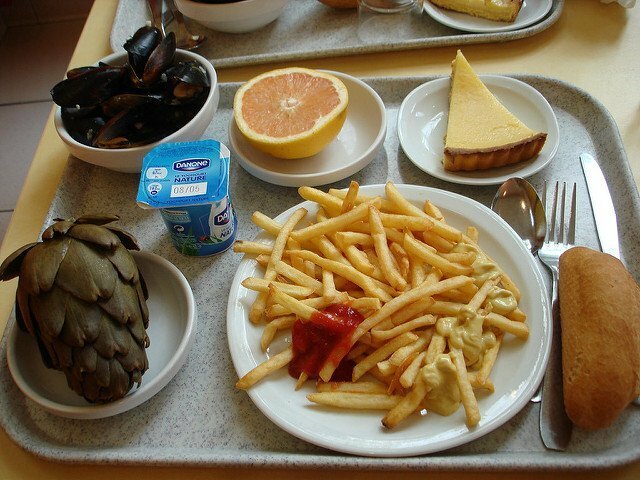 Above is the second photo of a school lunch in France. Frites or French fries and mussels is a very popular dish in France -especially in the south of France. Other than that, fries are not served very often. This dish has been served It has been served to my kids when they were in preschool as well as middle school and high school. A thing to note about French school meals. Milk is never served. Instead cheese or yogurt is ALWAYS served. Water is the only beverage served to kids. There is always a vegetable and fruit option along with a desert and bread option. 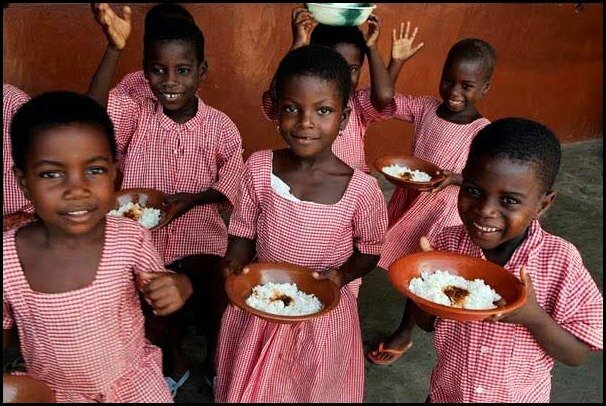 It’s a proven fact that children cannot concentrate in class, especially in the afternoon, on an empty stomach. 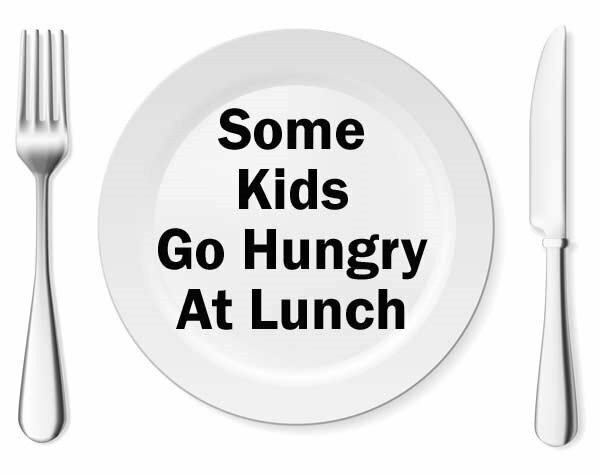 Unfortunately, some children are too poor and can’t eat lunch. This isn’t just in places like Uganda or other third world countries. it’s happening in first world countries too including poor sections of the U.S. If you are interested in learning more about what schoolchildren eat around the world, you should check out this book called What’s for Lunch around the world? 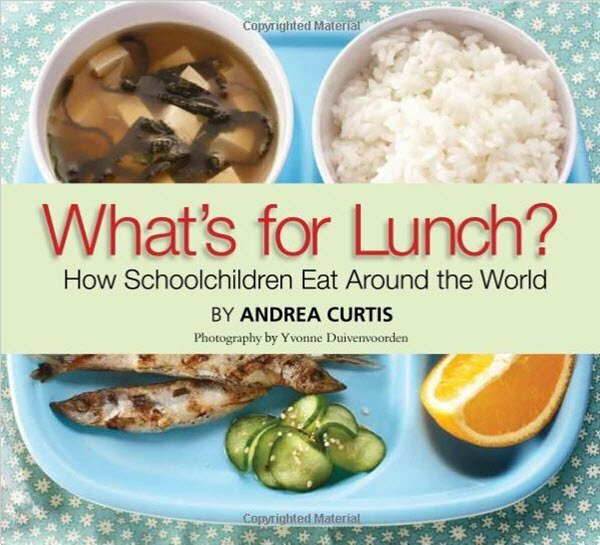 In What’s for Lunch, Andrea Curtis talks about inequality in the food eaten by a typical school child from thirteen countries around the world, including Afghanistan, Kenya, Russia, Japan, United States, Canada, Mexico and Brazil. In some countries, the meals are nutritious and well-balanced. In others, they barely satisfy basic nutrition standards. photo source for main photo.